I thought I’d share some of the many versions of rigging & tuning guides that are available for the Sunfish. most of them contain the same basic information, but occasionally new bits of information are added in, depending on the user’s personal preference and experience. Sunfish Rigging Manual (.pdf file) – this is the current(?) version from Laser Performance. 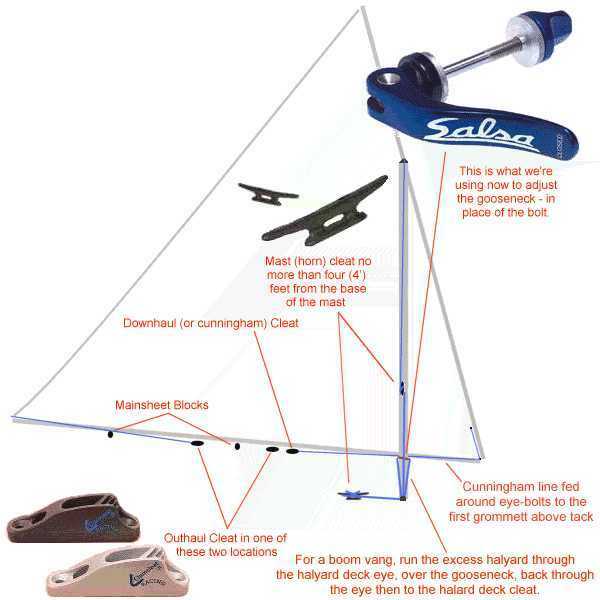 it has good pictures and shows how to set up the sailboat for both the recreational and race-style Sunfish. Sunfish Racing Sail Bending on and Tuning Guide – by Daniel Feldman/Wind Line Sails (this one is also more specific to the race-style sail) the “how-to” section on Wind Line Sails is also a great place to look for tips on inspection ports, fixing loose foam blocks, etc. Starboard Passage, put together by Eduardo Cordero & Paul-Jon Patin: there is information highlighting some of the ways to rig the sailboat more for racing (outhaul & cunningham adjustment, boom vang, etc. ), but don’t be discouraged by all those extra lines if you only want to sail for recreation – it really is quite easy to rig up a Sunfish and get it out on the water! 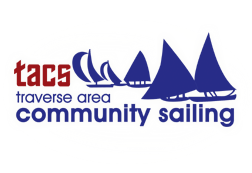 if you’re not a member yet, head over to the Yahoo Group – Sunfish Sailor and join the group today. the file database there is loaded with even more rigging information, including historic rigging manuals, tips for rigging older Sunfish, book & video suggestions for learning to sail, and a whole wealth of additional information related to Sunfish and other Sunfish-style sailboats (“clones”). if we ignore some of the additional ways to adjust a race-rigged sail, there are two key adjustment points available for the lateen-style Sunfish sail: the position of the gooseneck and the location of the halyard knot on the upper boom. a common suggestion is the tie the halyard between the 9th and 10th sail clips (start counting up from the tack of the sail, where the two booms connect together), but this is really just a starting point, that should be adjusted as you become familiar with how your Sunfish sails. over time you will learn to adjust the location depending on the weather and the strength of the wind. the Sunfish Tuning Guide for Racers has specific suggestions for various wind conditions. it is also highly recommended that you should buy a quick-adjust bolt to use for the gooseneck. Intensity Sails currently has one on sale for about $9, or you can buy one from a Sunfish dealer for about $22. The gooseneck should be moved fore and aft as the wind changes velocity in order to neutralize the helm and place the center of effort of the sail over the daggerboard. With a permanent black pen, mark a range from 17 to 23 inches at one-inch intervals along the boom, measuring from the apex of the spars. These lines represent your seven-inch range within which you will set your gooseneck. this diagram below from the Sunfish Class highlights some of the rigging and where it is all located, including some of the racing upgrades (the outhaul & cunningham). 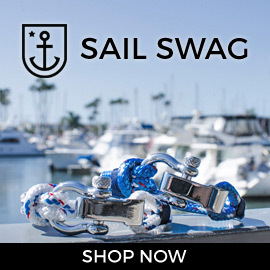 if you haven’t added the mast (horn) cleat (~$15) on the mast, it is highly suggested to do so – as this will reduce the large upward load that would be applied to the deck fairlead from the halyard. 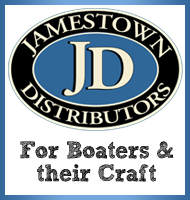 just be sure to still run the halyard through the fairlead and tie off to the halyard cleat on the deck, as this will prevent the mast and sail from sliding out of the mast step and away from the boat in case you tip over completely and “turtle” the boat. the extra cleats on the lower boom are only necessary if you are upgrading to the racing setup and adding the outhaul and cunningham lines. I hope that covers most of the basics, let me know if you have any comments, questions or suggestions! This post ROCKS as we all get tuned up for the season. Thanks for that racing rig photo/diagram…will be printing that out and using it this weekend. Bought all the parts, have yet to install. This is a HUGE help. Sunfish Sailor – thanks for the good feedback. This weekend? I’m jealous… we had a freeze warning here last night… but hopefully my 1st sail of the season isn’t too far off. They now have an adjustment bolt for the gooseneck? What will they think of next? What happened to just good ol’ fashion racing with what you got? They even have sails now that have more sail area for racing. I guess some take it very serious. I’m a competitive person, but I don’t want to re rig my boat just so it can beat someone. One book that I have that I liked is called “Sail It Flat” (I don’t remember the author-it’s a kind of “old” book on Sunfish rigging and racing tactics, but it’s in layman terms and great for the beginner. Very informative blog! Keep it up!! Always learning something new! classicalgas, I agree – there are so many things you can do to “upgrade” an old Sunfish, but you’ll end up shelling out quite a bit of cash. for most recreational sailors or local club racers, I don’t know that it would be worth the expense. I do think the adjustable gooseneck will be worth it, though. “Sail it Flat” is now included in the “Sunfish Bible“, offered by the Sunfish Class. I appreciate your thoughts and comments on my blog! We seem to share the same philosophy on sailing and racing. Thanks! Just came across this site. Thanks! I am completely new to sailing and bought a sunfish at a yard sale to go with the cabin we purchased up north this spring. I took it out for the first time last weekend and LOVED it. I am looking forward to learning how to sail it “right” and getting my two daughters involved. I hope you continue with your blog. I know keeping up on them is hard but this one has great info. thanks for the kind words! glad you had such a great time on the Sunfish, too. they can be a bit frustrating (as I am still learning how to sail it “right” myself), but also a ton of fun. Hi question on the 17″-23″ on lower spar do you measure back from cap on lower spar to 17 inches and start marking from there or were the spars cross just not sure on we’re to start the 17″ marking thanks for any help!! John, start your tape measure at the end of the metal on the lower spar. Then mark in 1″ increments. Thanks for reply my2fish appreciate it!! I am looking for an owners manual of a 1979 Alcort Sunfish. Thanks! Jared, I’ll send you a few files via email.